My previous recipe was a delicious Keto Spaghetti and Meat balls recipe where I used ground beef and ground pork as my choice of protein for the meat balls. Since I purchased 1/2 kg packets and I used half of each meat, I had some left over. I also had some of those canned tomatoes. 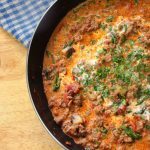 It was like the ingredients aligned and I knew I had to create the ultimate Keto Meat Sauce/Bolognese/Ragu. I watched a bunch of videos and figured out the subtle differences between a Bolognese and a Ragu. They come from different parts of Italy, one uses white wine, the other red and they are eaten with different kinds of pasta. After much consideration I realized that the Keto version of both these incredible Italian sauces would be pretty much the same. So give it a try, it’s great to cook in a big batch as it freezes really well. You can use it in many ways, perhaps just poured over some zucchini noodles or cauliflower rice, maybe make a lasagna with it or maybe just substitute it for the marinara sauce in my eggplant Parmesan or eggplant involtini recipe. You can substitute the pork and beef for a single meat of your choice. Alternatively you can use lamb and chicken as well for this recipe. 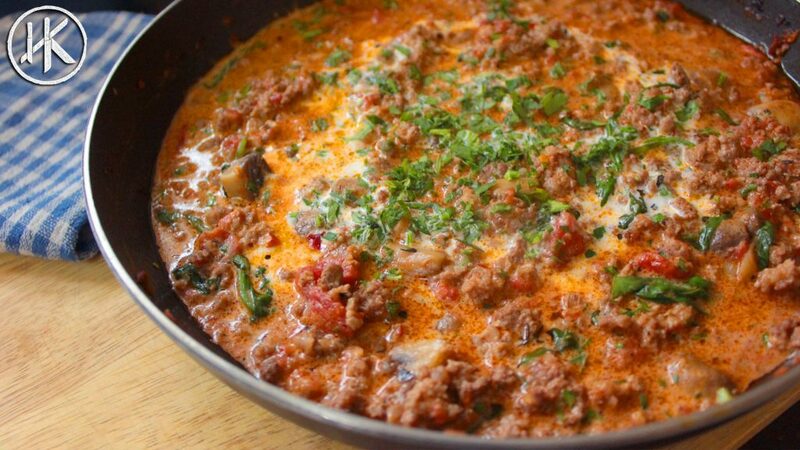 To up the fat content even more you can use ground meat with a higher fat %. I am unable to do this due to the only lean meat being available here in India. Also you can skip the cream and use coconut cream for a dairy free version, just remember it won’t taste the same and don’t call it a ragu or a bolognese. This recipe makes 6 servings. Get this recipe on myfitnesspal. Flavoured ground meat cooked in a rich tomato sauce. Perfect for all kinds of dishes or even just on its own. Add in the fresh thyme and garlic and cook down. Then chop and add the mushrooms to the pan. Made this the other night and it rocked. Keto or not it was great. Once again you have provided me with what looks like a great recipe AND entertained me. Thanks, m’friend. Is this with canned or fresh tomatoes? omg! I think I just died and went to food heaven … I made this for dinner last night and it was a fully fledged party in my mouth!! I made this tonight but I was questioning the amount of tomatoes. 100 grams equals 1 small tomato (I weighed it). Your video shows you adding what looks to be 4 plum tomatoes from a can so I added three more small tomatoes and it was delicious but I couldn’t even see the tomatoes once it was cooked. What size of a can of tomatoes did you add? Yeah I think I used a bit more than 100grams but put 100 in the recipe so people have a slightly lower carb count in the final dish. You can totally add more tomato for a richer sauce.